The EU is a unique economic and political partnership between 28 European countries that together cover much of the continent. What began as a purely economic union has evolved into an organisation spanning policy areas from development aid to the environment. Since then, a huge single market has been created and continues to develop towards its full potential. The EU is based on the rule of law: everything that it does is founded on treaties, voluntarily and democratically agreed by all the member countries. The members of the EU pool their sovereignty by taking joint decisions through shared institutions such as the European Parliament, which is elected by the EU citizens, and the European Council, which represents national go vernments. They decide on the basis of proposals from the European Commission, which represents the interests of the EU as a whole. From 1 January until 30 June 2019, Romania is leading the rotating EU Council Presidency. Promoting research and innovation, digitalisation and connectivity, in order to increase the competitiveness of the European economy and industry is one of its main objectives. Digital taxation, fairness in platform-to-business relations and E-privacy are some of the items on the agenda before concluding the current five-year EU policy cycle and ahead of the European Parliament elections at the end of May 2019. More information can be found on the Presidency website. The European Parliament represents the interests of the EU citizens and is the only EU institution which is directly elected. The Parliament holds its plenary sessions in Strasbourg and additional “mini-sessions” in Brussels. The Parliament is organised in seven political groups (dependent on the political affiliation of the members of the Parliament), as well as in 20 specialised committees which do the preparatory work for plenary sessions. 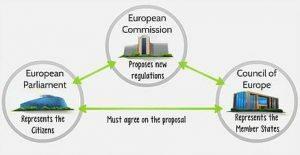 The European Commission is the second part of the institutional triangle that manages the European Union and it represents the interests of the European Union as a whole. Its members are appointed for a five-year term by agreement between the member states, subject to approval by the European Parliament. The Commission answers to the Parliament and can be forced to resign if the Parliament passes a motion of censure against it. The Council of the European Union (also known as the Council of Ministers) is the EU’s main decision-making body and represents the EU member states. The EU member states take it in turns to hold the Council Presidency for a six-month period. Every Council meeting is attended by one minister from each EU country. Which ministers attend a meeting depends on which topic is on the agenda (such as justice and home affairs, trade, transport and the environment).